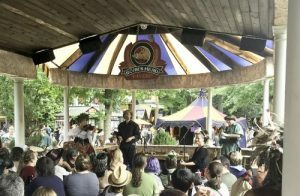 Maryland Renaissance Festival Deploys One Systems Loudspeakers | Northmar, Inc. 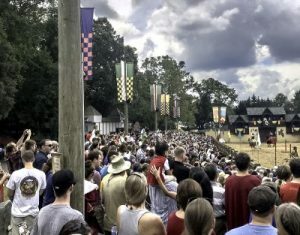 Mid South Audio upgrades five of ten stages and jousting arena in Crownsville, Maryland with 108/HTC and 108/HTC direct weather loudspeakers. One Systems Direct Weather loudspeakers at the Boar’s Head Tavern stage at the Maryland Renaissance Festival in Crownsville, Maryland. The fictional 16th-century English village Revel Grove, located in Crownsville, Maryland, recently upgraded the audio quality of their Renaissance Festival stages with One Systems loudspeakers. The upgrade was designed and installed by Mid South Audio, located in Georgetown, Delaware. The festival, spread over 25 acres, is the second largest in the country. It opens on the last weekend of August and runs for nine weekends. The grounds tout 10 stages and a substantial jousting arena. Mid South Audio upgraded five of the stages with One Systems loudspeakers and installed another distributed system at the jousting arena. Similar upgrades are planned for the other stages in the future. weathLeft/right systems of two 108/HTC loudspeakers, positioned to the left and right of the stages, were installed at each of the stages that offer live music to thousands of attendees. The stages that feature speakers and performers were equipped with left-right systems made up of 106/HTH loudspeakers. Because the jousting arena is circular in nature, LeCates specified 14 106/HTH, distributed around the rim of the arena. Both the One Systems 106/HTH and 108/HTH are two-way loudspeakers designed for use in marine environments and general purpose inland environments. The loudspeakers utilize 316-grade stainless steel (marine-grade) for all structural and rigging points as well as rigging accessories. All metal components that are not structural feature a newly developed marine-grade powder coat over 304-grade stainless steel. Both loudspeakers offer an installer configurable High Z or Lo Z mode. The 106/HTH offers a wide coverage pattern of 110 degrees by 70 degrees, ideal for short throw applications and near field sound reinforcement applications. The 108/HTH has a rotatable 60 x 40-degree horn installed, deal for medium-throw applications and where venue or space acoustics require a tighter high frequency pattern. It is also shipped with a wide coverage pattern 105 x 60 horn (also fully rotatable).